Week 2 of the 2016 season is upon us and it is bigger than ever. 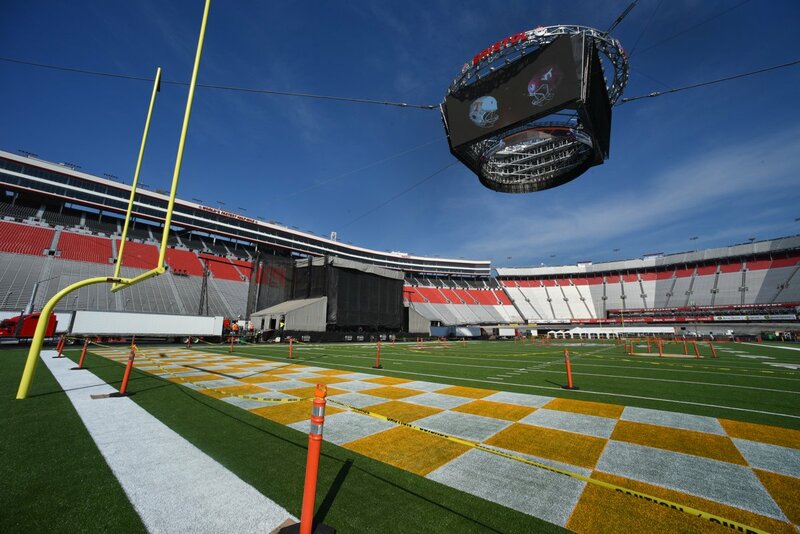 Literally, the biggest college band audience EVER will be brought together at Bristol Motor Speedway on Saturday to watch the Marching Virginians of Virginia Tech meet the Pride of the Southland from the University of Tennessee. There is a rumor a football game will be played there as well this weekend. Analysts are projecting over 150,000 fans will be in attendance. The speedway has been completely transformed. They brought in 450 truckloads of rocks and sand to make the infield level for football. Workers rolled out and laid down about 100,000 square feet of turf, putting the field together in a week-long process. There’s also Colossus, the 750-ton scoreboard that was installed in April. With most fans sitting far away from the action, Colossus will be used more than ever. It will be a very cool experience for both bands and their fans, we just hope you can hear them! Down in Baton Rouge Louisiana, the LSU Tiger Band will be hosting the Jacksonville State Marching Southerners in a match-up of epic proportions. However, this almost didn't happen. LSU earlier in the summer banned visiting bands from performing at halftime. Luckily they reversed the decision a few days later. Read about it here. You'll be able to watch both bands on the SEC Network+ online as part of ESPN's band coverage for the SEC Network. Elsewhere in the SEC the Carolina Band from USC will meet the Famous Maroon Band from Mississippi State in a monster match-up that could cause structural damage to Davis Wade Stadium during halftime. These two band programs absolutely bring it every time they are on the field. MS State fans are in for a real treat. A match-up flying under the radar is going to happen on the other side of the state from where we will be. The Stony Brook Marching Band is hitting the road to go head-to-head with the Temple Band in Philadelphia. The Temple Band is coming off of a big week 1 halftime victory where they got some major attention for their dance during JT's "Can't Stop the Feeling". In case you missed it you can see it here. A huge band match-up is taking place in Pittsburgh, PA as the Pitt band hosts the Penn State Blue Band. Our team is here and will be bringing you an exclusive inside look at the Keystone Classic starting with Pitt band rehearsal early Saturday morning, their bus ride over to Heinz field, pregame concert, pregame shows, stands tunes and halftime. Follow us on @CollegeMarching and on our facebook page for live video and updates throughout the day. We are looking forward to seeing these two great bands in action. Use our #HalftimeHype and tag us in any social media posts that you'd like us to share this weekend.